2010's July is a strange little month, with a few surer bets hedged among a group of films that might end up at roughly the same box office place. A lot of questions abound: What's Inception going to be like? Will anything finish with less than $40 million? And could this be the first July in a long time without a single $200 million earner? Stay tuned. Introducing possibly the biggest wild card of the summer, and the season's one remaining title that Internet-frequenting movie fans are still salivating over. Inception's trailer mixes fantastical dreamworld special effects with more conventional action and thriller elements, and its pedigree certainly shows good breeding: it is unquestionably being positioned as the thematic follow-up to director Christopher Nolan's The Dark Knight (the release date is no coincidence), and it stars Leonardo DiCaprio (back in box office's good graces after his stay at Shutter Island), along with an international hodgepodge of talent, including some Nolan vets (Cillian Murphy, Ken Watanabe). Early word is on the positive side, though the premise seems like a somewhat less bloody, more technologically-derived variation on what the Nightmare on Elm Street movies have been doing for some time now. Either way, if Nolan has done well here, the sky's the limit on the numbers. P.S. 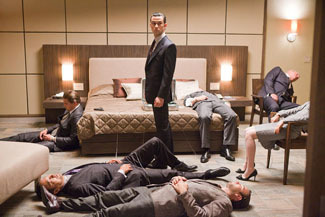 : I sincerely hope that Inception doesn't have the same identikit, creatively-deprived ending as Shutter Island. Enough is enough with those.